Gov. 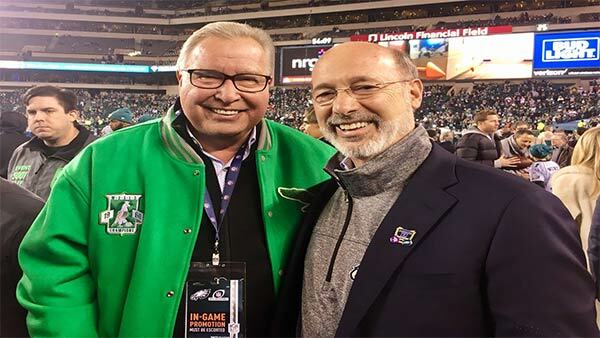 Tom Wolf poses with Ron Jaworski in a picture tweeted from the Eagles game Sunday night. PHILADELPHIA -- The governors of Minnesota and Pennsylvania are wagering some sweet treats on Sundays NFC championship game. Pennsylvania Gov. Tom Wolf will win a five-pound Pearson's Salted Nut Roll if the Philadelphia Eagles beat the Minnesota Vikings. But Minnesota Gov. Mark Dayton will get five pounds of Tastykake Butterscotch Krimpets if the Vikings score the victory in Philadelphia. Wolf also says the Pennsylvania State Capitol Building in Harrisburg will be lit green starting Saturday night and will remain that way through the game Sunday in a show of support for the Eagles.